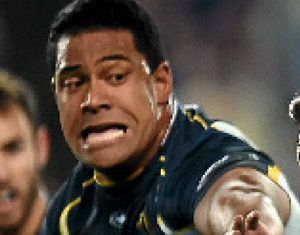 BRUMBIES prop Scott Sio says he is certain his team will face one of its biggest tests of the season against the Waratahs in Sydney on Sunday, despite the Super Rugby champions losing two of their first four games. The Brumbies lead the table with 20 points from four wins, their only loss coming from a last-minute penalty against the Chiefs in Hamilton in round two. "It's going to be one of our biggest tests this year," he said. "They're the champions from last year. They had a tough, close loss last week against the Highlanders, so they'll be looking to put in a good performance back at home this weekend." Fellow prop Ben Alexander, who scored two tries in the Brumbies' 29-0 win against the Reds last weekend, also said he was expecting a fierce contest. "It'll be a big battle. They scrum really well and they've been getting a few penalties," he said. Alexander, who owns a pub in Canberra with teammate Scott Fardy, also said his team had improved significantly since last year when it lost to the Tahs 26-8 in the semi-finals. "The way we play is very fatiguing. Last year we jumped out of the blocks really well, built nice leads but then for whatever reason we'd fall away in second halves," he said. "Whereas this year it's been really pleasing that we've been finishing games off."